These beads are cursed. I’ve never had this much trouble with any bead except when I tried to encase yellow with clear. I usually have several made by this time of year but things keep happening to them. I flung two across the room when I picked up the towel they were laying on. While these beads can take a beating, hitting a hard floor and having them bounced around, well, I don’t need to say more. This one I used sterling silver bail and chain. I used brass chain and finding on this one. And I added dangles. 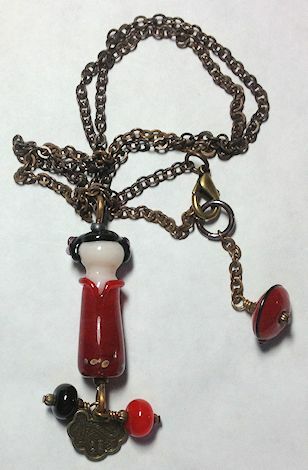 I’m hoping to make a few more kokeshi doll beads this weekend out of some different colors.